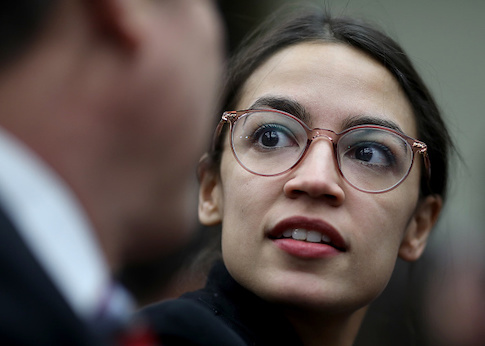 A conservative nonprofit recently filed an FEC complaint against Ocasio-Cortez, arguing that the candidate violated campaign laws in her relationship with a PAC and business operated by her chief of staff, Saikat Chakrabarti. Luke Thompson was the first to call attention to Chakrabarti's role as architect of the opaque fundraising scheme. Left-wing Intercept reporter Jon Schwarz noted in response that Thompson had once worked at Right to Rise, a 2016 pro-Jeb Bush super PAC that was recently fined by the FEC for accepting foreign donations. Ocasio-Cortez quote-tweeted his tweet and crowed that "the creepy org filing bogus ethics complaints against me just *actually* got hit with one of the biggest fines in FEC history." Whoah: the creepy org filing bogus ethics complaints against me just *actually* got hit with one of the biggest fines in FEC history. But as Toronto Star reporter Daniel Dale and others immediately pointed out, Ocasio-Cortez's tweet is incorrect. The National Legal and Policy Center filed the FEC complaint against her, not Right to Rise. Ocasio-Cortez tacked on a correction tweet, clarifying that she was talking about the "same guy who operated at the org," and not Right to Rise itself. But even that correction was wrong. Thompson has no affiliation with any of the organizations filing the FEC complaint. Thompson for his part took the false allegations in stride. Update 3/14/19 8:50 a.m.: A previous version of this story referred to Luke Thompson as a current employee of Applecart. Thompson left the firm prior to Rep. Ocasio-Cortez's election to Congress. This entry was posted in Politics and tagged Alexandria Ocasio-Cortez, Campaign Finance, FEC, Twitter. Bookmark the permalink.